Subterranean termites can be very damaging considering that they can go undetected only to be noticed when they have caused a great extent of damage to your property. It would be great if there was a way of telling whether these termites pose threats to your property before extensive damage occurs. Thanks to HALO, you can now find out whether your home or office has potential subterranean termite threats. HALO is a subterranean termite monitoring program created by Dow Agro Science: the world leader in manufacturing termite control products and systems. It is a superior electronic termite detection program that can save a property to a great extent. Our professional termite exterminators from TORO offer the HALO Termite Monitoring system for termites in Miami and the surrounding areas and for both residential and commercial settings. We proudly serve Miami-Dade, Palm Beach, Broward, Monroe, Lee and collier counties in Florida. TORO Pest Management now offers Halo Electronic Termite Detection. 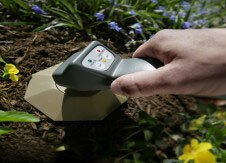 This unique monitoring system has been proven in field trials to accurately detect termites. Each Halo monitoring station contains a wood-based sensor that termites like to eat. Termites especially like the layered material that triggers the electronic signal. When termites have damaged this layered material, our Halo hand-held indicator will light up and sound an alert. If no termites are found, you’ve still gained something valuable and that is peace of mind. We’ll continue monitoring to keep you up to date on the termite status. You can have monitoring done on your property quarterly to ensure there are no threats, but monthly monitoring might be more necessary for locations that are heavily infested with termites. Subterranean termites are a real threat and are always looking for a new food source. TORO Pest Management can put a Halo around your home or commercial property to detect subterranean termites that may be looking at your home for their next meal. Halo Electronic Termite Detection can be an easy and affordable addition to your regular pest control or lawn care service. If termites are discovered, TORO will discuss your options for treatment and credit $75.00 toward a complete termite treatment. Ask us about our Halo Termite Detection Program; it is the best way to protect your family, your home and your property. Let us provide you with a more enjoyable living environment. Call The Experts at Toro Pest!